Today, the modernist vision of the ideal gallery space, which accentuates the art object while the surrounding architecture recedes, is still a prevailing trend. However, in current day Toronto, at a moment when architectural renovation and the conversion of historical buildings has become endemic, the reality is that very few exhibition spaces possess pure purpose-built lines and forms. YYZ, for instance, located in the large complex at 401 Richmond Street West is defined by a modernist aesthetic that has been inserted into a late nineteenth-century industrial building. Through the two renovations that have been carried out since the artist-run centre moved into this location in 1997, the lexicon of the modernist gallery space has been laid over the rugged building features that still speak of its original function. Given this architectural history then, what does it mean that local artist, Christine Swintak, who was invited to use YYZ’s gallery space as her studio for the summer, has inserted a rustic shed into this semi-modernist setting? And then, what does it mean that she built a modernist structure connecting the inside of the shed to the outside of 401 Richmond? Consideration of some of the artist’s previous projects The thing that won’t let you walk away (an elaborate frontispiece constructed at the Art Gallery of Ontario in 2005 out of IKEA furniture, second hand clothes, discarded office supplies and other detritus) and the Dumpster Hotel (a luxury hotel room created in a City of Toronto dumpster for Nuit Blanche in 2007), makes it evident that she has a penchant for using humble materials and references whether the languages of vernacular building or waste management structures to challenge our expectations about the physical and virtual construction of the art world, and for revealing the elitist underpinnings of its modernist origins. A project which shared these inclinations was the VIP Shed, created in 2007 in response to the AGO’s invitation to participate in Massive Party, an annual fundraising event. Swintak erected a pre-fabricated, sheet metal shed in the midst of the posh affair; given its tiny proportions and the 1,500 guests, the lineup to get into her exclusive sanctum began almost immediately. Luckily, she had a roster of local artists (all of whom she insisted receive free tickets to the exclusive and expensive event) with her to manage the wealthy folk anxiously awaiting entry. Setting up the garden shed at Massive Party was Swintak’s attempt to bring the antics of the art gallery fundraiser back down to earth. In the context of these examples of Swintak’s past work, the shed currently erected in YYZ might then be understood as critique of the white cube and its somewhat uneasy intervention into the industrial architecture of 401 Richmond. But while the earlier projects relied to a certain extent on humour in order to achieve their full impact, the Self-Aware Shedseems to eschew comedy for pathos. There is perhaps a certain absurdity in the current enterprise, which saw Swintak taking apart a wooden shed, transporting it from its rural site north of the city, and resurrecting it inside the downtown gallery space. However, her exploration of these elements does not resolve with the kind of witty effortlessness that has infused much of her recent work. Her juxtaposition of the refinement of the gallery and the unpretentiousness of the shed is more complex. Yes, the shed serves to interrupt the space of contemporary art presentation by drawing our attention to the structural vestiges that denote the once industrial usage of the building in which the gallery is housed. This is apparent in the positioning of the shed, which is situated awkwardly in the corner of the gallery, partially blocking the opening to the space, underneath a ceiling fan and with its door stuck wedged open by a pillar that recalls the building’s industrial past. But while it was perhaps Swintak’s original intention to create a simple equation in which the insertion of the rustic structure into the modernist gallery would draw attention to the industrial past of the building, or to insert something real into the gallery in order to draw attention to the artifice of the space, what she discovered was a much more multifarious set of relationships, between herself and the space, herself and the shed, the shed and the space and the outside world. During her occupation of the space, it became evident that her critique could not be conveyed with a quick one-two punch i.e. dropping the shed into the gallery rather it needed to be conveyed as a complex argument that drew attention to all aspects of the connections between the space, the shed, the artist and the outside world. To convey the convolution of these associations, she constructed a corridor that joins the shed’s large double doors to the gallery’s loading entrance; at this entrance, she created a sort of Juliet balcony that enables viewers to look out into the back alley behind the building. Visitors to YYZ would normally find these doors closed, and as they are painted white, they more-or-less blend into the walls under normal circumstances. In Swintak’s treatment of the space, they have been transformed into a look-out point that elevates what would normally be considered a banal view. In effect, this creates a theatre of the real, where the incidental elements of the outside world are absorbed into the exhibition, and in a sense, absorbed into the space. 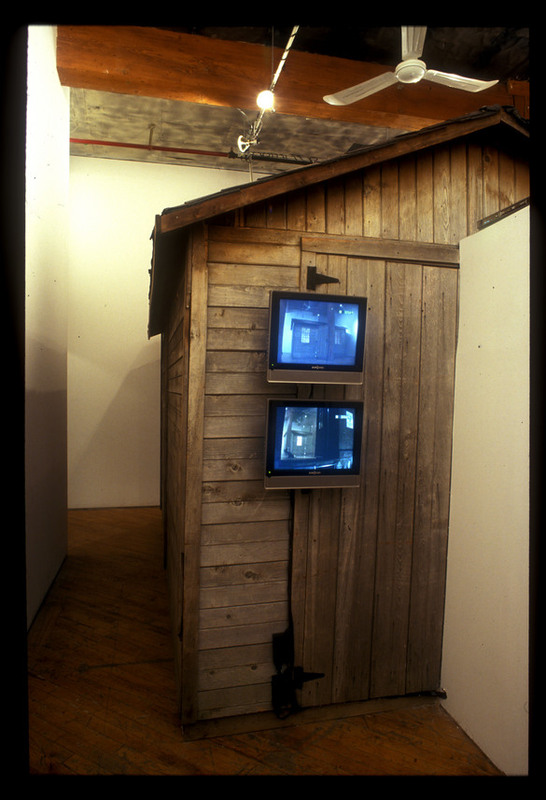 The structural elements are accompanied by a two-channel video that features views of the shed set against a simulated day break and sunset, in which the artist commands day to begin and night to fall. Swintak’s exploration of the relationship between the interior space of the gallery and the exterior space of the real world evokes the ideas of Robert Smithson, albeit in a manner that disorders the aims of his ruminations about the site (the land) and the non-site (the gallery). And of course her use of the shed as the central motif of her project calls to mind his 1970 project, Partially Buried Woodshed. Initially devised during an artist residency at Kent State University as an investigation into entropy, the simple action of Smithson’s shed project was to dump truckloads of dirt onto a derelict building until its central beam cracked under the weight. This anti-pastoral act took on unexpected implications when, just a few months after he completed the project, members of the Ohio National Guard killed four students and wounded nine more during a protest of the US invasion of Cambodia. When someone inscribed May 4 Kent 70 on thePartially Buried Woodshed, it became a de facto memorial to the horrific event, although it was set afire in 1975 by arsonists and only its foundation exists as a vague imprint in the earth today. It is unlikely that there will ever be a shed created by an artist that bears the same kind of profundity and mythology as Smithson’s, but as Swintak discovered, even the most apparently innocuous of sheds can come to embody allusions that provide us with insights into the essence of its past, present and potential environments. Regardless of what initially compelled Swintak to bring the shed into the gallery space, in the end, the project is defined by her desire to let the shed explain itself hence the title Self-Aware Shed, which implies that it understands that it exists as an entity that is unique from the things that surround it. Perhaps the impulse to impart consciousness to a shack is a little unusual. But it also allowed the artist to step out of the role of cultural arbiter which she had occupied in her previous projects. Here, Swintak does not tell us what to think about the constructedness of the art world rather, she creates a set of relations that invite us to interact with the shed, the gallery, the building and the outside world as we see fit. MICHELLE JACQUES is a Toronto-based curator and writer. She is currently Associate Curator, contemporary art at the Art Gallery of Ontario, where her recent work has included projects with Luis Jacob, Jennifer Steinkamp, Karen Henderson, Kori Newkirk and Christine Swintak. From 2002-2004, she was programming director of the Centre for Art Tapes, a Halifax-based artist-run centre that supports the production and presentation of media art. Jacques’s recent writings include Some Thoughts on Speech Bubbles in Pro Forma: language/text/visual art, volume 3 (YYZBOOKS, 2007); and Dialogues: Inhabiting Culture at a Time of Rapid De-Publicization, co-authored with Janna Graham and Anthony Kiendl for the thirtieth anniversary issue of Fuse magazine. SWINTAK is an interdisciplinary artist, educator, and inventor. Part armchair scientist, part amateur enthusiast, Swintak’s projects generally involve an experiment with an unknown outcome. Working in a number of media including installation, intervention and performance, Swintak has exhibited in a variety of contexts including Nuit Blanche (Toronto), Art Gallery of Ontario (Toronto), ArtCity Festival of Art and Architecture (Calgary), Conflux Festival of Psychogeography (New York), Space 1026 (Philadelphia), The Living Museum (Greensboro), Khyber Centre for the Arts (Halifax), Dalhousie University Art Gallery (Halifax) and Rockefeller Centre (New York). Swintak has also presented numerous public installations and relational happenings in places like Vancouver, Teslin, New York, Salt Lake City, Death Valley and Los Angeles. Swintak is currently working on a series of Impossible Projects with assistance from the Canada Council for the Arts. She received a BFA from NSCAD University and is committed to continual self-directed research. SWINTAK would like to thank Deirdre Fraser-Gudrunas, Iris Fraser-Gudrunas, Heather Haynes, Martin Heath, Emily Hogg, Michelle Jacques, Chad Jagoe, Steve Kado, Heather Lee, Sandy Plotnikoff, Amy C Lam, John Marriott, Jon McCurley, Don Miller, Seth Scriver, Ward Williamson, Allan Kosmajac and everyone at YYZ for their input and support.